Hi Friends: It's time for another Coffee Lovers Blog Hop! Still love my coffee during the summer time! JessicaLynnOriginal stamps is one of the sponsors for the hop - here's my first card featuring this cute Brentwood Coffee Lovers Summer 2017 digital stamp available for free for the hop. Crop the sentiment and coffee cup image and print images onto smooth white cardstock and color with Spectrum Noir markers. Cut the focal image with the square die, then add glossy accents to beak. Stamp small hearts onto the coffee mug, color, then add Glitter Brush pen to them. Cut the sentiment, edge with marker, then add to recliner. Ink edges of printed papers, arrange/glue them onto A2 card base and stitch around edges. Add thread to center of card, then use foam squares to add focal image to card. Fussy cut the mugs, stamp and color hearts, then add Glossy Accents and ultra-fine glitter. Add to bottom of card with foam squares. wow, love all your details and the added stitching. I think I need to start using my Janome again. Thanks for the inspiration. Fun colors and I really like the glossy accents. Terrific card! Love this cute owl sipping his coffee in peace, great colour combo also! You did a fabulous job with this darling image of Brentwood. Love the gorgeous square die you used, too. Fantastic design and so cute! I love the color combo on your card and Brentwood is perfect! 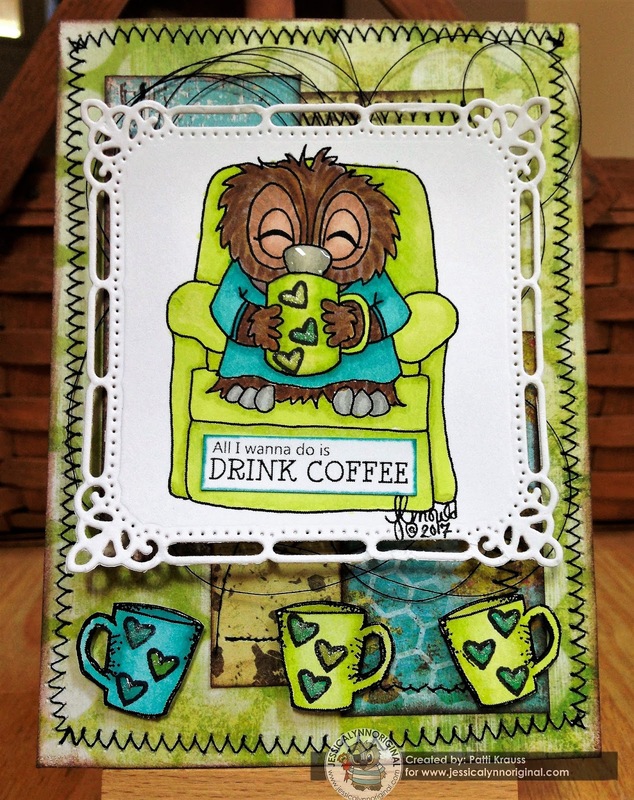 Great stitched edge and looped thread on your design - sweet owl in green with his caffeine! Just love everything about this card, Patti! The colors... the layers... the stitching... the extra thread... awesome! I love how you colored the image, and thanks for adding the marker colors. That is adorable!I love the colors.